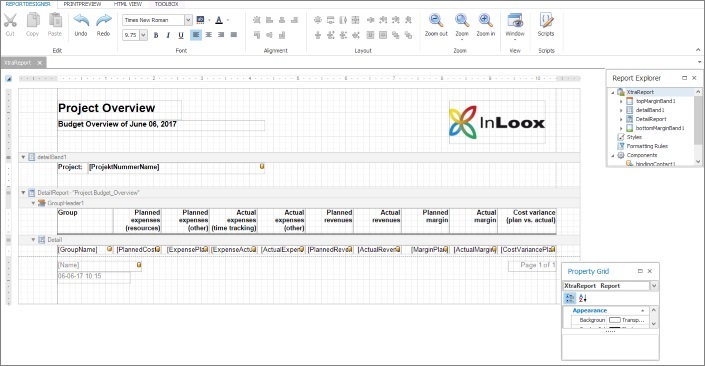 By using the InLoox report designer you can create individual report templates on your own. This chapter shortly introduces the main features of the report designer. However, it is not possible to explain everything in detail due to the immense range of features. By clicking on New you can create a new report. 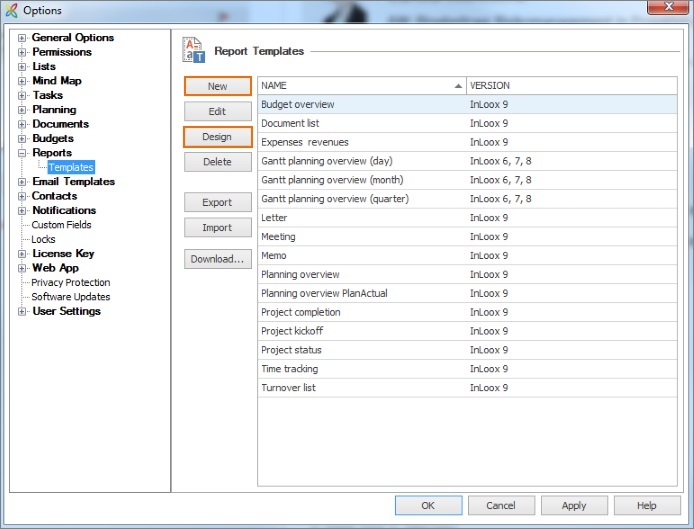 By clicking on Design or double-clicking on an already existing report you can edit the report templates. In both cases the InLoox report designer is going to open. 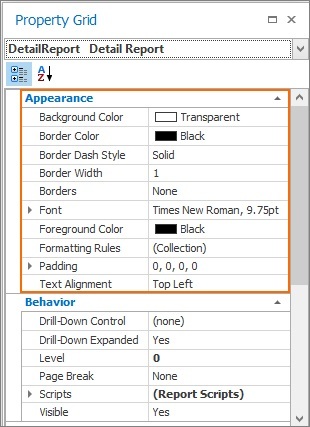 Using the report designer you can individually create report templates. Using the report designer you determine font type, font size, positions and data. 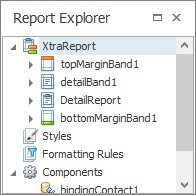 The report explorer shows the structure (margins) of a report. To open the report explorer, click on Windows in the ReportDesigner tab and select Report Explorer from the drop-down-list. In the property grid you can determine the default layout for the template. To open the property grid, click on Windows in the ReportDesigner tab and select Property Grid from the drop-down-list. The data source for the report can be determined in the property grid, too. To open the property grid, click on Windows in the ReportDesigner tab and select Property Grid from the drop-down-list. In the property grid scroll down to Data. Zoom features are especially helpful to receive an overview to large reports. The zoom features are located in the ReportDesigner tab. You can switch between three different views: ReportDesigner, PrintReview and HTML View. You can access those views via the different tabs. 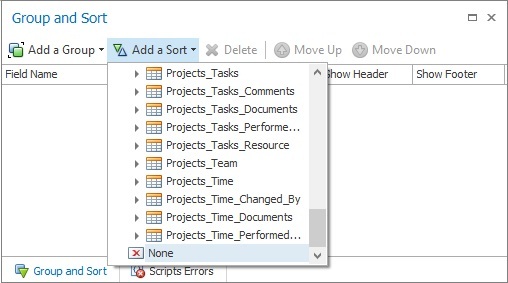 To open the tool overview click on Windows in the ReportDesigner tab and select Tool Box from the drop-down-list. 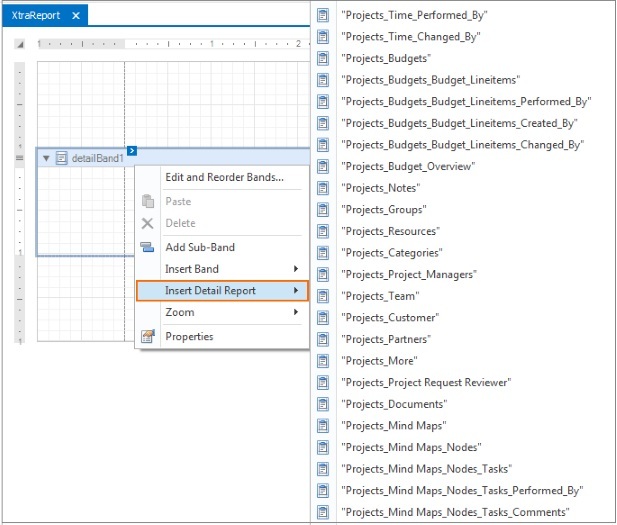 You can select detail reports regarding specific project areas in the report. 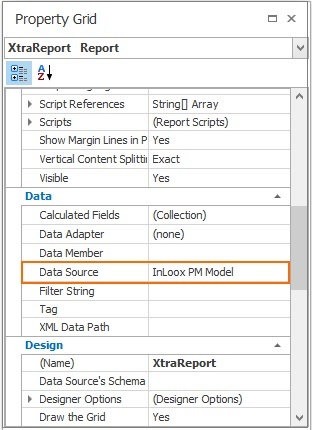 Therefore, right-click on the detail band in the report and select Insert Detail Report in the context menu. Now you can select a project area to create a report on it. To edit the detail report, open the window Field List via ReportDesigner >> Windows >> Field List. 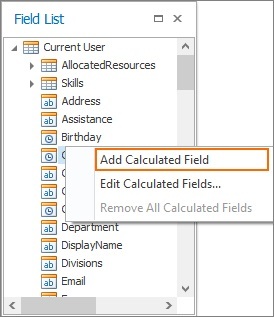 Drag-and-Drop all fields you will need into the detail report. 1. 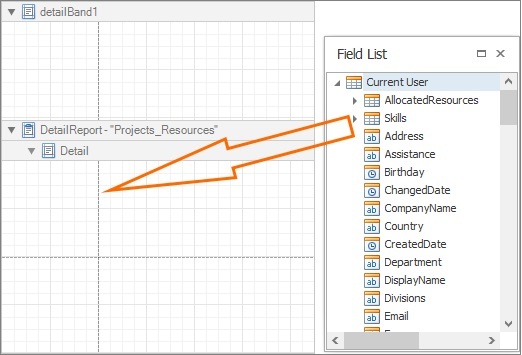 Open the field list via ReportDesigner >> Windows >> Field List. 2. Right-click in the window field list and select Add Calculated Fields in the context menu. 3. 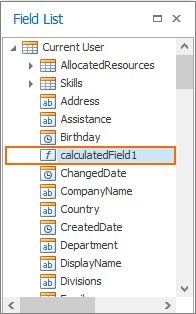 A new calculated field will appear in the field list. 4. Right-click on the calculated field and select Edit Expression. A new window is going to open. There you can edit the calculated field using for example if/else constructs. 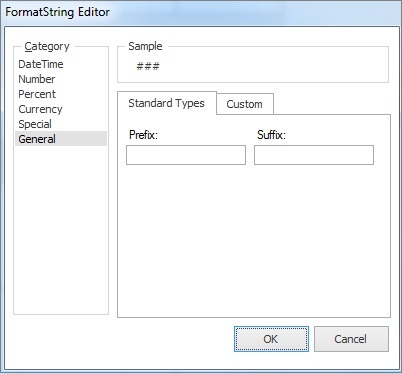 Formatting: Additionally, you can format data fields and the related formatting rules. To edit the formatting, click on the blue arrow right above the specific field and select Format String. The FormatString Editor is going to open. There you can edit the formatting rules.